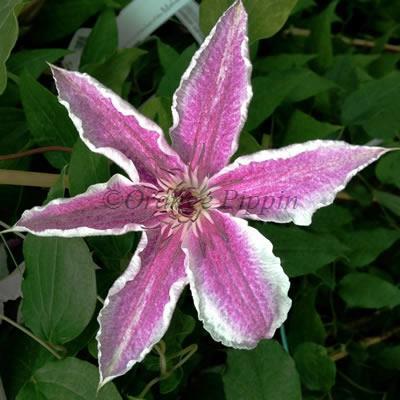 Clematis 'Starlight' has large candy-pink striped, star-shaped flowers with a wavy edge to each of the petals during May, June and again in September. This attractive, non-evergreen climber can be grown up a trellis, or along a garden wall, fence, through a large shrub or tree, or planted in a container supported with bamboo canes or an obelisk on the patio. Clematis 'Starlight' was raised and introduced by Joe Link of Haybridge Nurseries, Kidderminster, England in 2007.